Should You Base Your Fencing Project off Design or Function? When you need a fence for your outdoor space, it can feel a little daunting to determine which style is best suited for your needs and landscape. Choosing the right one should be based on what you’re specifically aiming to achieve with it. Maybe it’s to enclose your backyard pool, or to gain some privacy from your neighbours, or to keep the dogs in while they run around the yard. Whatever the main reason is, it will help you determine whether you should base your fencing project off design or function (or maybe both). Here are some points to consider to help you gain more clarity with your decision. Is privacy the main reason for your new fence? If so, then the design will come into play more in this decision. Selecting a fence that’s designed with space in between the boards won’t do much good here. Instead, you’ll need to look at closely integrated designs that fill in any gaps, or you could even consider closely spaced lattice designs which can provide enough privacy when shrubbery is planted in front of it. For a good amount of privacy, consider the level of your terrain and the location of your main seating areas to determine the necessary height that you’ll need. Are you worried about securing the perimeter of your home more so than anything? Then both design and function should be looked at closely. Selecting a fence that’s at least 8 feet high is recommended. The fence should also have a straight, flush surface without any easy areas to grip on to or climb up on. So avoid any fences with horizontal rails. And of course, having a durable, lockable gate is a must. Are You Concerned About Your Dogs? 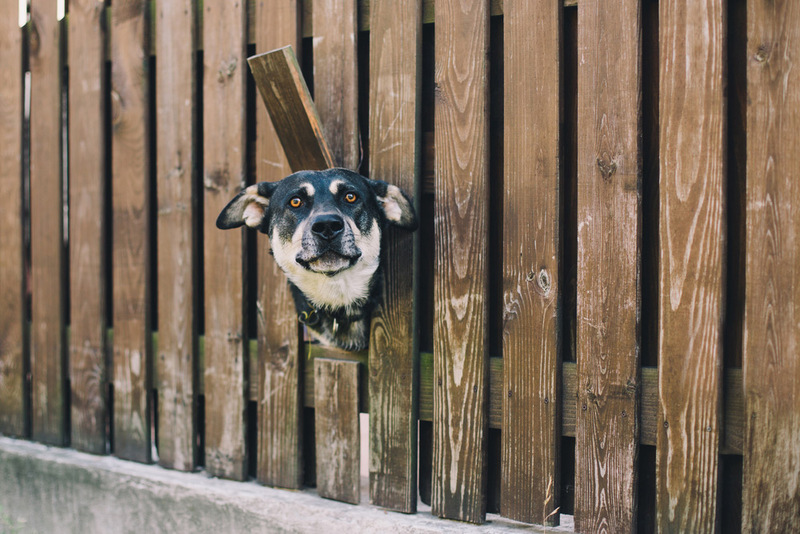 If your dogs have a tendency to make a run for it, then a well closed-in fence is definitely a welcomed addition to give you some peace of mind when you let them out to run around the yard. But remember to think about their habits. If your dogs are big and can jump high enough, then a 3-4 foot fence might not do the trick. Also if they’re diggers, the fence should be buried a good 6 inches under the ground. So both design and function should be considered here. If you don’t have pets or small children and if you live in a safe enough neighbourhood where you aren’t too concerned about security, then your main focus will, of course, be on the design. When you want to improve the curb appeal of your home, look for a fence style that will compliment the architecture of your home. Whether your preference is more traditional, rustic, or chic and modern, a fencing expert will be able to help you determine which design will work well with your home exterior. If you’re still confused about whether you should base your fencing project off design or function, give us a call at Fence Masters. Our experts can assist you and help you determine what will work best for your needs. Contact us today!